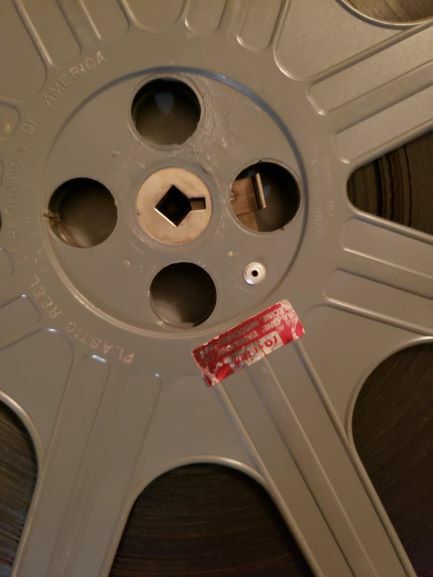 8mm Forum: Odd reel hole shape? » 8mm Forum » 8mm Forum » Odd reel hole shape? Author Topic: Odd reel hole shape? I just bought a few S8 titles off ebay some of the reels have an odd spindle opening. What is this? Do I have to transfer this to another reel leaving the reel the film came on useless? It looks like a 16mm hub, but I'm not sure why this would be on a S8 reel?? Yes that is definitely a Sixteen mm reel. You will need to transfer the film onto a Super eight reel. Those reels were produced a long time ago for use on the Extend-A-Reel long play unit made in the USA by RaCine. The system used 16mm reel size shafts hence yes they are indeed the same square size as a 16mm reel. Lots of collectors at the time also modified 16mm reels to use as long play super 8 reels - I used to split 16mm 2000ft Tuscan ones, cut down the inner hub width, then re-glue the side back on and use them on Spondon long play units. Sadly the reels you have will of course never fit your Fumeo or Beaulieu so it looks as though you will need to track down some suitable replacements. Thank you Kevin that now makes sense. I bought several films some on different reel sises and all have this hub. Luckily I already have on hand replacement reels. Cutting down a 16mm reel for S8mm use sounds interesting, too bad they never standardized the same shaft for both formats. Does this reel fit on ST-1200? You may get some more info there. Thank you for the links Winbert, good reading and good info. Alan, if those are 14 or 15 inch reels, I may have some use for them if you don't need them. Thanks!